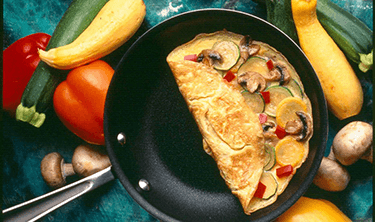 Breakfast in Bed – recipe below for a mouth-watering Farmer’s Market Omelet. Give her some much needed quiet time. BEAT eggs, 1/4-cup water, cheese, basil and garlic powder in medium bowl until blended. HEAT butter in same pan over medium-high heat until hot. TILT pan to coast bottom. POUR In 1/2 of the egg mixture. Mixture should set immediately at edges. When top surface of eggs is thickened and no visible liquid egg remains, PLACE 1/2 of the filling on one side of the omelet. FOLD omelet in half with turner and sliced onto plate; keep warm. REPEAT with remaining egg mixture and filling to make second omelet. SERVE immediately.